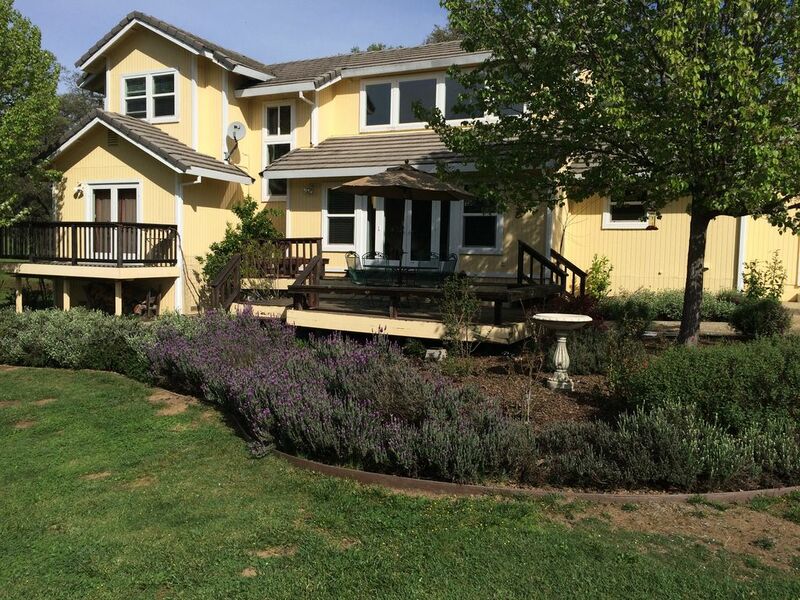 Gorgeous House with Cherry Orchard in Sierra Foothills! This beautiful house is located on 5 acres in Cameron Park Estates in El Dorado County in the Sierra Foothills. It is half an hour from Sacramento and 15 minutes from historic Placerville. It is also near Folsom Lake and Coloma where Gold was first discovered. It is a unique place to observe wildlife such as hawks, deer, and wild turkeys. The deck offers stunning views over the 5 acres covered with old oak trees, and the fruit tree orchard next to the house. It is a wonderful place to hang out, relax, watch the children play and enjoy nature, while you're just 5 minutes away from restaurants, and shopping. SORRY NO LARGE EVENTS CAN BE HELD AT THIS PROPERTY! If you like to be active, there are many opportunities such as visiting museums, gold mines and antique stores and the many excellent wineries in the El Dorado and Amador County. You can also go biking, boating, bathing in the American River, hiking, exploring caves. The choices are endless. In the winter this property is conveniently located one hour from Sierra at Tahoe Ski Resort. A day trip to beautiful Lake Tahoe takes only one hour and a half. - Wineries: the Sierra Foothills feature several wine growing regions such as the Shenandoah Valley, the Fairplay area in south El Dorado County, Apple Hill and Gold Hill. - Ski at Sierra at Tahoe (one hour), come home and light a fire in our wood fireplace. Prepare a cheese Fondue in our fully equipped kitchen. - Visit El Dorado Hills with many great Restaurants, Shops and Movie Theaters. - The owners will be happy to give you more tips on things to do. During our stay, 8 adults were more than comfortable in this lovely home near Shingle Springs. There was plenty of communal space for visiting and the kitchen was easy to use. The outdoor area was wonderful, giving privacy and area to walk and enjoy. Grocery and restaurants were 5 min away. Owner was fast to respond to questions. Highly recommend this VRBO. Beautiful house in a nice gated community not too far from lake Folsom. We had a wonderful time! We had so much fun here. We would definitely stay again! Amazing! Everything we hope for! We are sorry but we cannot allow big events at our location. Sun-Thu ..................... $250/night .. $1300-$1600/week. Fri-Sun including holidays .. $300/night. 3 days minimum for holidays, Thanksgiving 4 nights. $150 cleaning fee. $250 Deposit. Extra charge may apply for additional people exceeding 8.